Faster, fresher, tastier: Whether you’re a kitchen novice or are able to speed-chop onions like Julia Child, it never hurts to have a couple culinary hacks on hand. Consider this your go-to list this holiday season. 1. MAKE YOUR GREENS LAST LONGER. There’s nothing sadder than damp, wilted salad greens. To get more life out of your arugula, spinach and mesclun, line a plastic container with paper towels, put the greens in and cover with another paper towel. If you bought boxed salad, you can use that same plastic shell. The paper towels absorb excess moisture from the greens, while the container keeps leaves loose and prevents them from getting crushed. 2. MAKE PANCAKES WITHOUT THE MESS. Pancakes are pretty straightforward to make, but they can leave your kitchen looking like a tornado just blew through. To cut down on the mess, try this simple process: Mix all the ingredients in a plastic bag, then cut off one of the bottom corners to create a makeshift pastry bag. This lets you to squeeze the batter onto the skillet and even make fun shapes, depending on the size of the opening. It’s a familiar scenario: You want dinner to come together quickly, but you’re stuck waiting for the water to boil. To speed things up, put the lid on the pot and let the steam heat do some of the work. Also: Make sure you’re using only as much water as you need. The more water, the longer it takes to boil. For a really fast boil, try using an electric kettle. Brown sugar is a baker’s best friend, and it needs to be properly stored to ensure it doesn’t harden. First, make sure to store it in an airtight container or plastic bag so that moisture doesn’t leak out. Then, try a tip from Real Simple and put a marshmallow or two in with your brown sugar. You could also try the old-fashioned method of using a slice of bread instead—or even an apple slice. 5. USE ALL OF YOUR FRESH HERBS. Lots of recipes call for fresh herbs, but usually just a teaspoon or a few sprigs worth. To keep the rest of your cilantro, rosemary, and oregano from languishing in the fridge, put them in a small jar of olive oil and make an herb-infused variety. 6. MAKE YOUR OWN MAYONNAISE. Mayo’s great to have around, not just to spread on sandwiches but to use in pasta salads, dips, and other indulgent sides. And you don’t even have to buy a jar of Hellmann's or Miracle Whip. All you need are a few minutes and a few simple ingredients: an egg, a cup of olive oil, lemon juice and some salt. Whisk the egg yolk with 1-2 tablespoons of lemon juice, then slowly add in the olive oil while continuing to mix. Add a pinch of salt and a teaspoon of water, if needed, to thin out the mixture. 7. MAKE BACON WITH A WAFFLE IRON. Culinary guru Alton Brown offers this hack as a way to achieve perfectly cooked bacon without the pool of popping grease. Set a waffle iron to medium heat, then place bacon strips (half strips will probably fit best) onto the griddle. Close the lid and heat for 2.5 minutes. Once time’s up, move the bacon around and heat for another 2.5 minutes. The result: nice, crispy bacon, with grease left over to cook those hash browns in. 8. CLEAN YOUR GRILL WITH AN ONION. Rather than scrub your grill down with a brush or hope that a blast of heat burns away all the scraps, cut an onion in half, then slide it over the grill flat side down using a fork. And make sure the grill is nice and hot to help loosen things up. Texas grill masters swear by this all-natural remedy. 9. BRING STALE BREAD BACK TO LIFE. This trick won’t work for slices of sandwich bread, but for baguettes and whole loaves that have gone hard, it should be just the ticket. Hold the bread under running water (you read that right), then place it in the oven and heat it for 6 to 7 minutes at 325 degrees. 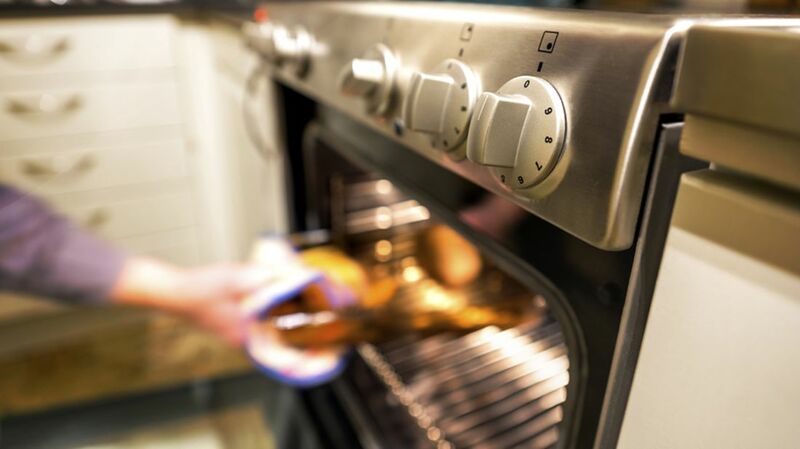 Steam from the water will rehydrate the bread, and the oven’s heat will ensure the exterior is nice and firm. 10. GET AVOCADOS TO RIPEN FASTER. There’s nothing like a soft, perfectly ripe avocado. The trouble is finding one that’s in that all-too-fleeting sweet spot between hard and mushy. If all you can find at the supermarket are those hard green avocados, don’t despair: You can speed up the ripening process by sealing them up in a paper bag. This won’t work overnight, but it’s notably quicker than simply leaving them out in a bowl. To make the process go even faster, add a banana or an apple to the bag. Both fruits give off ethylene gas, which promotes ripening. Even if you don’t floss regularly, you should still keep a small box handy around the kitchen. Unwaxed, unflavored dental floss can cut cakes, soft cheeses, and other foods cleaner than a knife can. It can also be used to tress meat, lift cookies from a cookie sheet, and unstick stubborn dough from your countertop. Who knows, you might even be inspired to use it between your teeth. 12. GRILL FISH ON TOP OF CITRUS. Lots of home cooks are intimidated by the idea of grilling fish at home—in no small part because they imagine a burnt, stuck-on mess. To keep fish from sticking to the pan or grill, and to give it an extra burst of flavor, cook it atop a bed of sliced citrus fruit. Try salmon slices atop lemon slices, or sole over orange slices. 13. PEEL GINGER WITH A SPOON. Fresh ginger is a flavorful, versatile ingredient. But it can be tough to peel away the coarse brown skin with a knife or even a fruit peeler. Instead, use a spoon, which can get around all those nooks and crannies. Lightly scrape the tip across the surface, and the skin will give way to the white flesh underneath. 14. CHILL WINE AND BEER FASTER. Every hard-working cook needs a proper libation. If white wine’s your thing but your bottle’s not properly chilled, fill a glass and plop in frozen grapes or blueberries. This will cool the drink without diluting it. If you’re a beer drinker, try wrapping the bottle or can in a wet paper towel and putting it in the freezer for 15 minutes. The paper towel will pull any warmth away from the can faster than just sticking it in the ice alone can. 15. HARD BOIL EGGS IN THE OVEN. If you need to hard boil a lot of eggs at once—or if you just haven’t mastered the boiling water method—you can try this oven trick. Line each groove of a muffin tin with paper muffin cups, then place an egg inside each cup. Heat the eggs for 30 minutes at 350 degrees, then submerge them in ice water for 10 minutes.